"We all have a destiny." The Orchard has unveiled an official US trailer for the Argentinian crime biopic El Angel, which first premiered at the Cannes Film Festival this year. The film also played at the Sarajevo and Toronto Film Festivals, and will next stop by Fantastic Fest in Austin, TX. 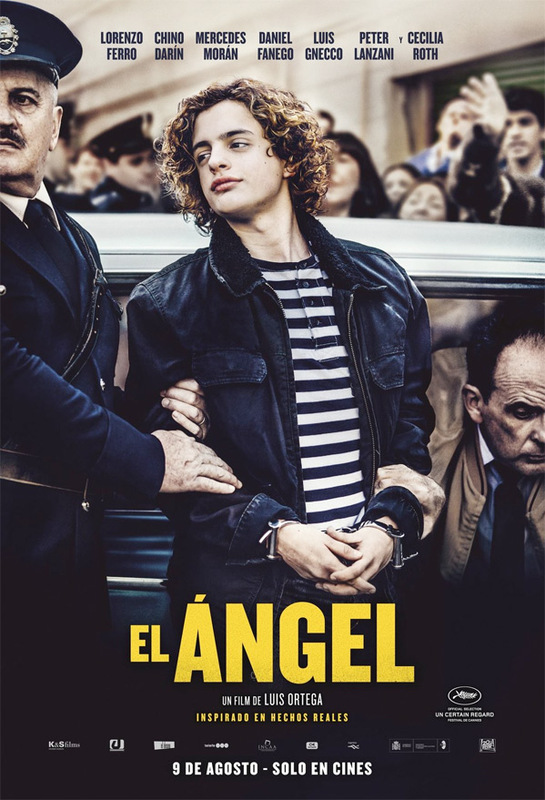 El Angel tells the story of one of Argentina's most notorious criminals, a boy known as "The Angel of Death" because of his cherubic looks. It all starts with Carlitos at age 17, when he meets a friend in his high school named Ramón and together they form a dangerously charming duo. The young man with the golden curls and the deadly aim was arrested in 1972, having just turned 20, with 11 homicides and over 40 thefts to his name. Starring Lorenzo Ferro as Carlos, along with Chino Darín, Daniel Fanego, Mercedes Morán, Luis Gnecco, Peter Lanzani, and Cecilia Roth. This looks like another fascinating and slightly scary portrait of a serial killer. See below. Buenos Aires, 1971. Carlitos (Lorenzo Ferro) is a 17-year-old with movie star swagger, blond curls and a baby face. As a young boy, he coveted other people's things, but it wasn’t until his early adolescence that his true calling—to be a thief—manifested itself. When he meets Ramon at school, Carlitos is immediately drawn to him and starts showing off to get his attention. Together they embark on a journey of discovery, love and crime. Killing is just a random offshoot of the violence, which continues to escalate until Carlitos is finally apprehended. Because of his angelic appearance, the press dubs Carlitos "The Angel of Death." Showered with attention thanks to his beauty, he becomes an overnight celebrity. Altogether, he is believed to have committed over forty thefts and eleven homicides. El Angel is directed by Argentinian filmmaker Luis Ortega, of the films Black Box, Monobloc, The Dirty Saints, Damn Summer, Dromómanos, and Lulu previously. The screenplay is by Luis Ortega, Rodolfo Palacios, Sergio Olguín. This premiered at the Cannes Film Festival this year. The Orchard will release El Angel in select US theaters starting on November 9th.